The world of piano competitions has clearly shown that Fazioli is leading the way for many of the next generation of pianists. The concert platform proves that some of the most renowned pianists in the world are choosing to play Fazioli. The great musical educational institutions are putting their money where their mouths are. The Royal College of Music now has two performance spaces for Fazioli and a dedicated Fazioli teaching studio with two size B models. 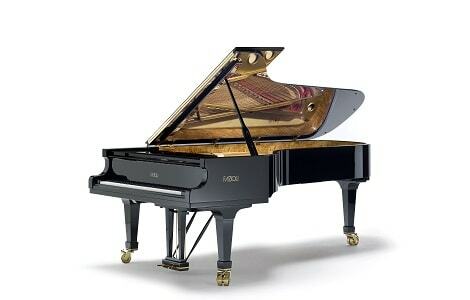 Trinity Laban Conservatoire has chosen a Fazioli concert grand as its new main performance piano. The Purcell School, which produced Martin James Bartlett (the 2014 BBC Young Musician of the Year who insisted on performing on a Fazioli in the final) has become the world’s first Fazioli Centre of Excellence which means their main performing and teaching pianos are Fazioli. At the Yehudi Menuhin School four of the seven teaching/performance pianos are Fazioli with both of the main piano teaching rooms having a Fazioli as the first piano. Birmingham Conservatoire has two Fazioli pianos and hopes to take more soon. Fazioli instruments were chosen for seven out of 12 performances by the finalists in the Sydney Piano Competition 2016. At the 2017 Rubinstein Competition 50% of the finalists chose Fazioli and among them the first and second prize winners. And at the most recent Scottish International Competition, all finalists chose to play Fazioli! The state-of-the-art Fazioli concert grand, which contains a new patented design action and soundboard, is rapidly becoming the choice of the next generation. Daniil Trifonov regularly requests a Fazioli for his Wigmore Hall and Barbican recitals. One need say no more.